During January and February of 2018, Edison Research and Triton Digital joined forces to conduct a national telephone survey (in English and Spanish) of 2000 Americans aged 12 and older. They’ve done the research and crunched the numbers to bring you the Infinite Dial 2018. Running since 1998, Infinite Dial is one of the longest-running surveys of American media consumer behavior, covering a wide range of digital media topics. This year’s focus was placed on Podcasting, Smart Speakers, In-Car Audio, and Online Audio, among other things. Let’s take a brief look at what they found. 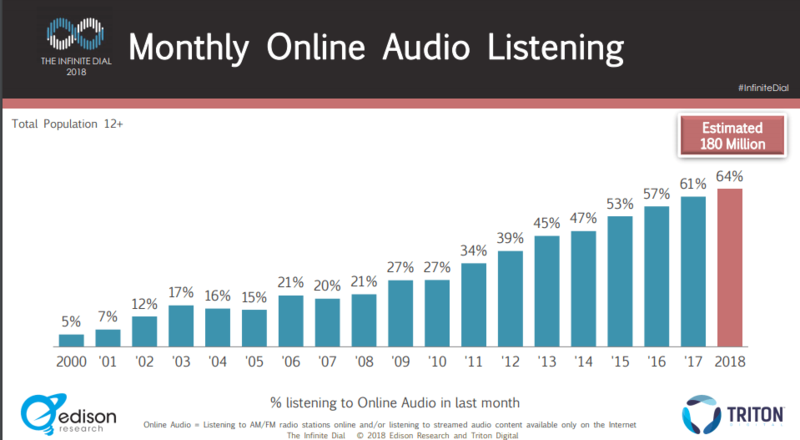 There has been a steady increase in Americans aged 12 years and above who listen to online audio. 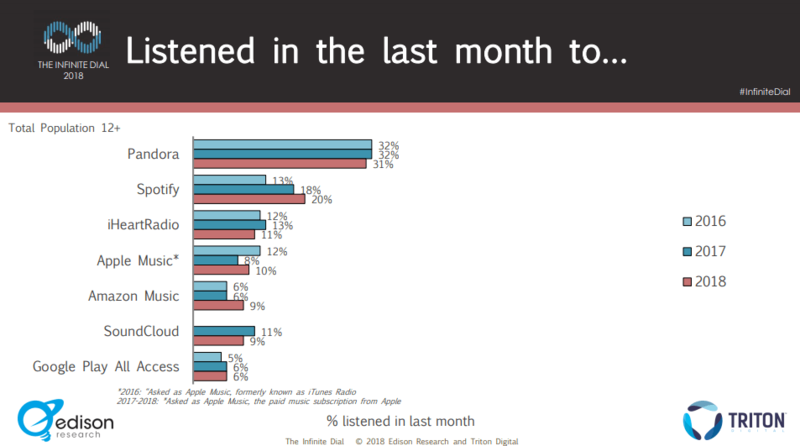 Both monthly and weekly listener statistics have risen since 2017, by 3% and 4% respectively. 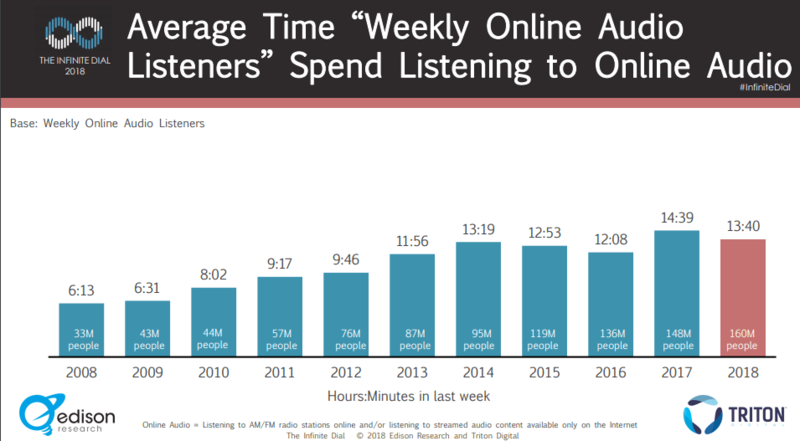 The average time weekly listeners spend listening to online audio has decreased by roughly an hour in the last year. 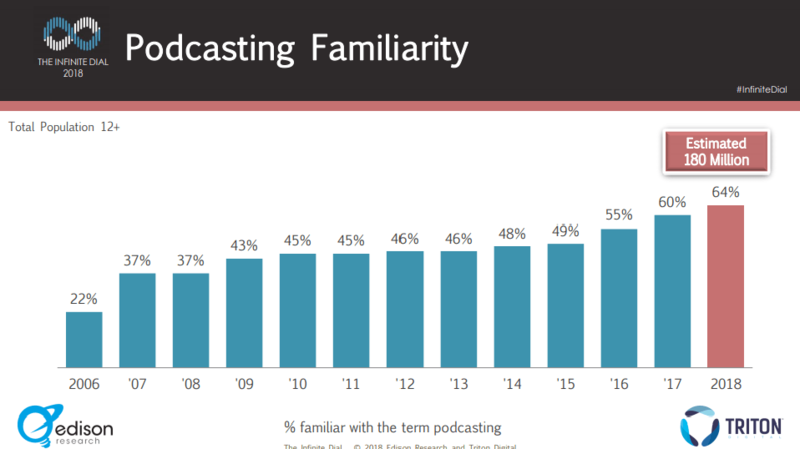 Some good news for all the podcasters out there – podcast popularity is on the increase. Among the Infinite Dial 2018 participants, familiarity with podcasting has risen from 60% to 64% in the last year amongst Americans aged 12 and above. The research found that up to 44% of Americans who are 12 and older have now listened to a podcast, in comparison to the 40% in 2017. The number of people who listen to podcasts in their cars has also risen by 4% in the last year, from 19% in 2017 to 23% in 2018. Smart speaker ownership is on the rise in America with 18% of respondents now owning a smart speaker 2018. 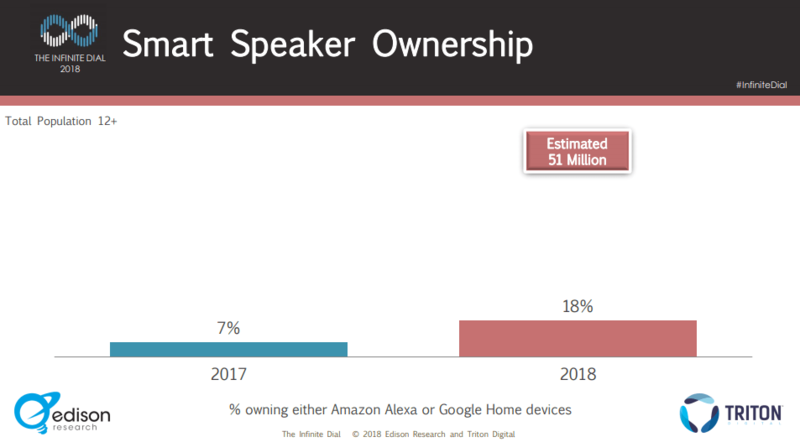 The stats on smart speaker ownership amongst Americans has thus more than doubled in the last year, from 7% in 2017. 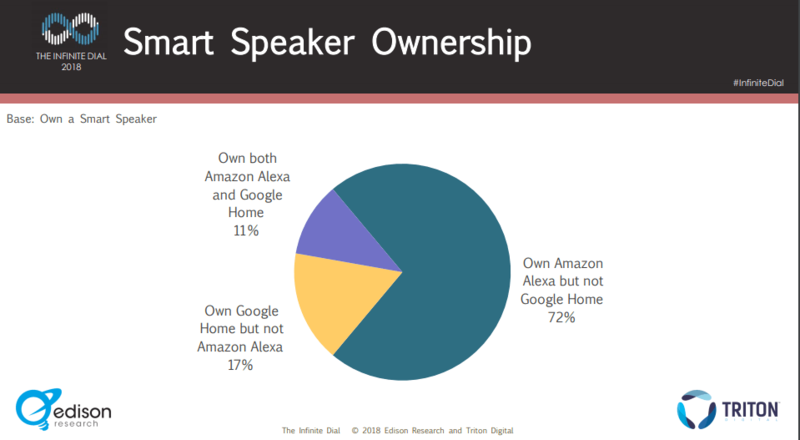 72% of survey participants own an Amazon Alexa device, but nothing from Google Home and 17% of the respondents own a Google Home smart speaker, but nothing from Amazon. Only 11% of respondents own both brands. 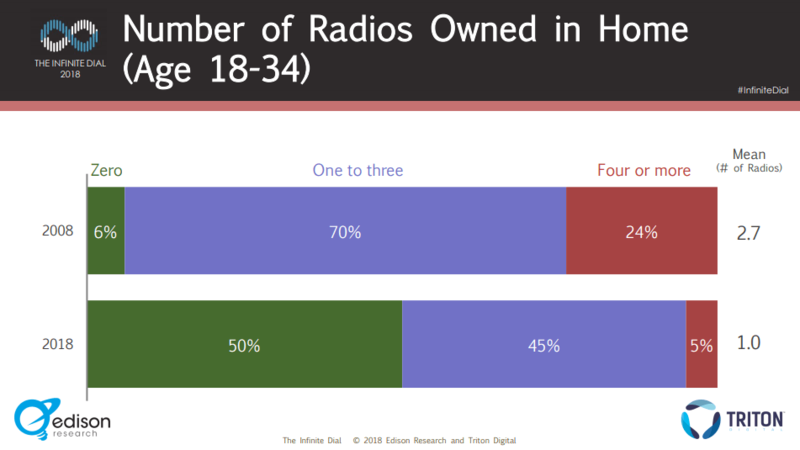 Whilst smart speaker ownership in American households is on the rise, in-home AM/FM radio ownership still sees a steep decline. 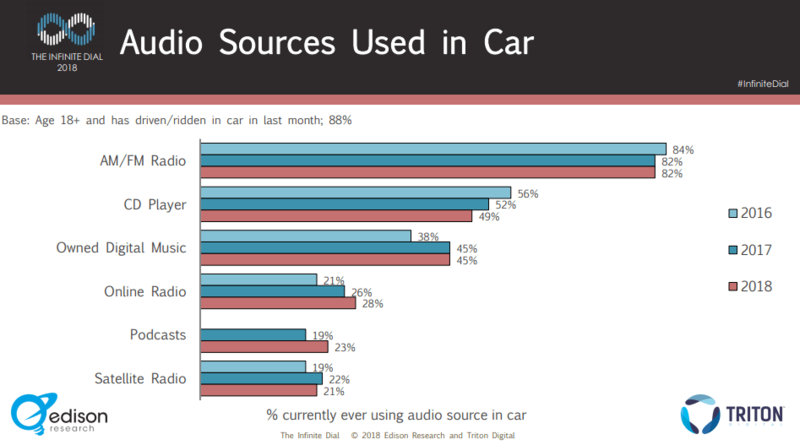 AM/FM radio still dominates as the most-used in-car audio source, although the stats have not increased since 2017. Instead, it has remained at a steady 82% since 2017. The use of CD-players has gone down to 49%, but it still holds second place for in-car audio. Owned digital music remains the same as the previous year at 45% of respondents. The amount of respondents who listen to online radio in their cars has risen to 28% in 2018 – that is a 2% increase from 2017. 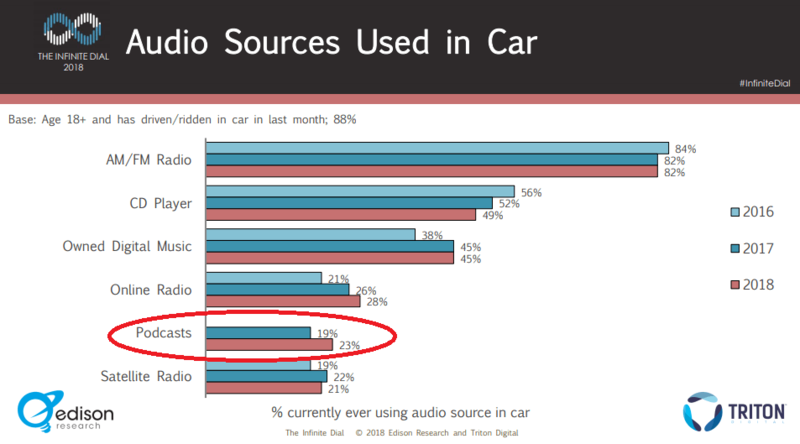 As mentioned previously, in-car podcast listening has risen from 19% to 23% in the last year. The Infinite Dial 2018 results show that Pandora is still the leader in audio brand awareness, with a strong 85% brand awareness among participants. iHeartRadio came in at second place with 65% awareness; with Apple Music and Amazon Music came in tied at 60% awareness. 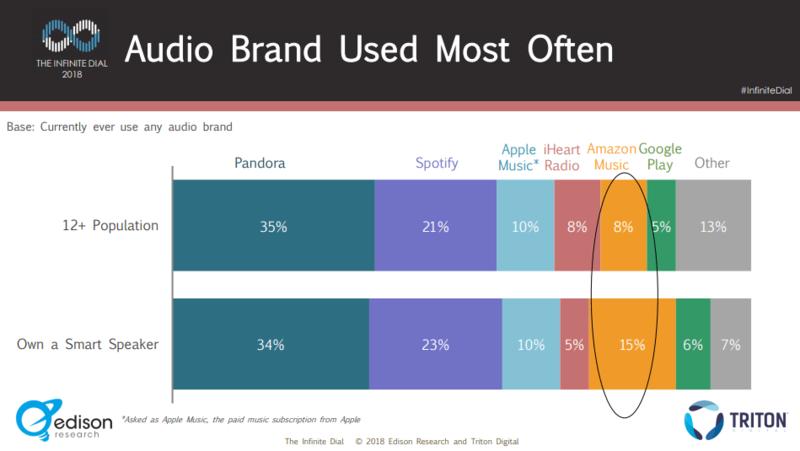 Pandora wins out as the most used audio brand among Americans 12 years and older at 35%; Spotify came in as the second most-used audio brand, at 21%. Pandora leads in monthly listeners, with 31% of participants listening to the service in the past month. Spotify takes 20% of the monthly listener share, whilst iHeartRadio and Apple Music came in at 11% and 10% respectively. 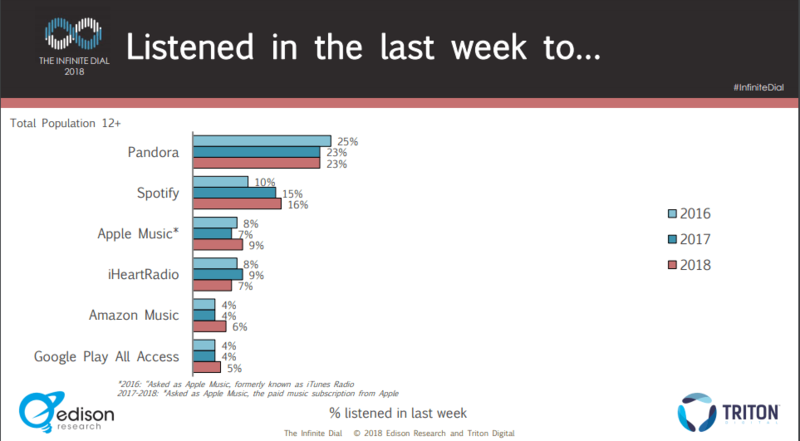 Regarding weekly listeners, Pandora is the frontrunner once more, clocking in at 23%. Spotify took second place, with 16% of participants having used the service in the past week; whilst Apple Music came in third with 9%. 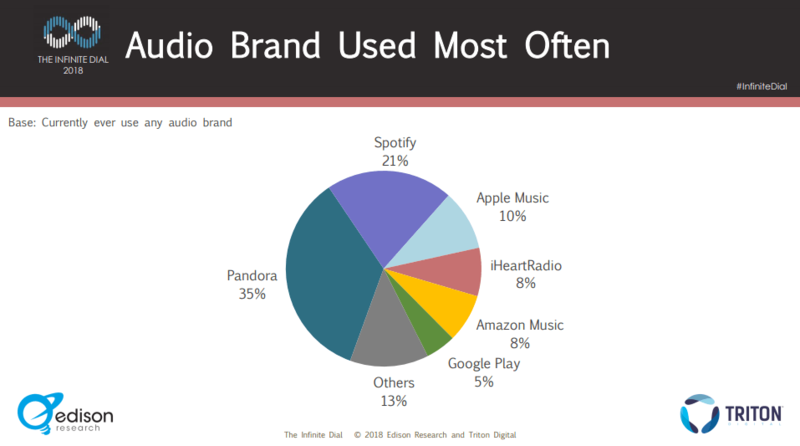 It’s important to note that whilst Pandora is still the leading audio brand amongst respondents, there has been a decrease in usage compared to previous years. In contrast, Spotify, Amazon Music, and Google Play All Access each had their highest usage rates in the past three years according to the Infinite Dial 2018 results. It is also interesting to note that smart speaker ownership had a significant impact on the usage of online audio brands. Amazon Music saw a significant rise in usage amongst participants who own a smart speaker (Amazon Alexa). The use of Amazon music sees a jump from 8% to 15% in households that own a smart speaker. 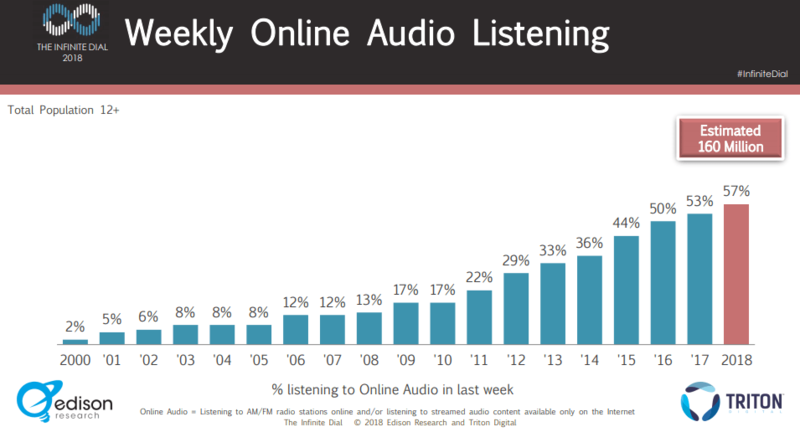 Built on roughly 20 years of information and statistics, the Infinite Dial Study has become one of the most trusted surveys on digital audio, and digital media trends. It has become a source of information for broadcasters, the financial community, and ad agencies alike over the years. 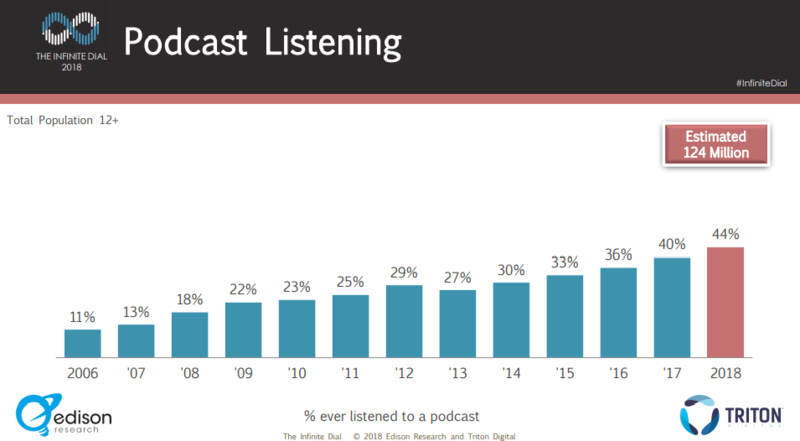 In summary, the Infinite Dial 2018 study found steady growth in podcast familiarity and listenership, including in-car listeners. Smart speaker ownership is on the rise, whilst in-home AM/FM radio ownership is declining steadily. Whilst it has experienced a slight drop in popularity, Pandora remains the most popular online audio brand for listeners. 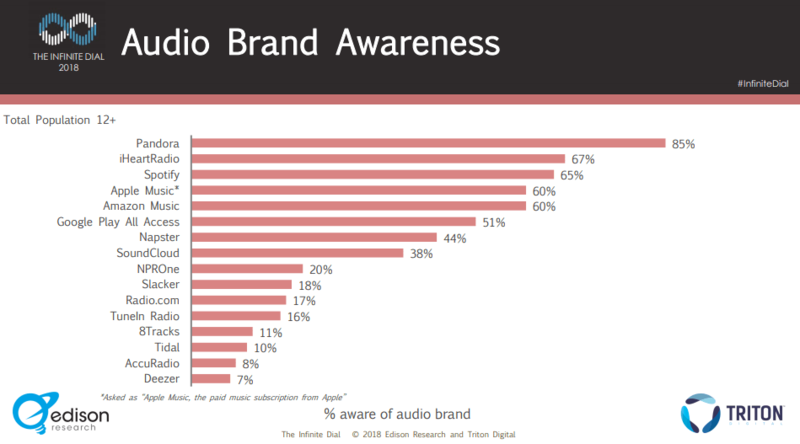 Other audio brands like Amazon Music and Spotify are on the rise regarding brand awareness and usage.